Derek Buckler (1910 – 1964) took after his father who was a highly inventive entrepreneur and, after competing in motorcycle events in the 1930s, Derek built his first car, the Buckler Special, in 1947. This was at a time when Colin Chapman was building his first Lotus specials and while Chapman chose to base his on Austin 7 components, Buckler concentrated on the equally popular 1172cc Ford side valve models. Both Chapman and Buckler were involved in the launch of the 750 Motor Club’s 1172 formula and, like Lotus, Buckler’s early competition successes led to demand for similar cars from eager motor sport enthusiasts. Buckler was successful in a wide range of events from trials to speed hill climbs and he even won the Mobil Economy Run. 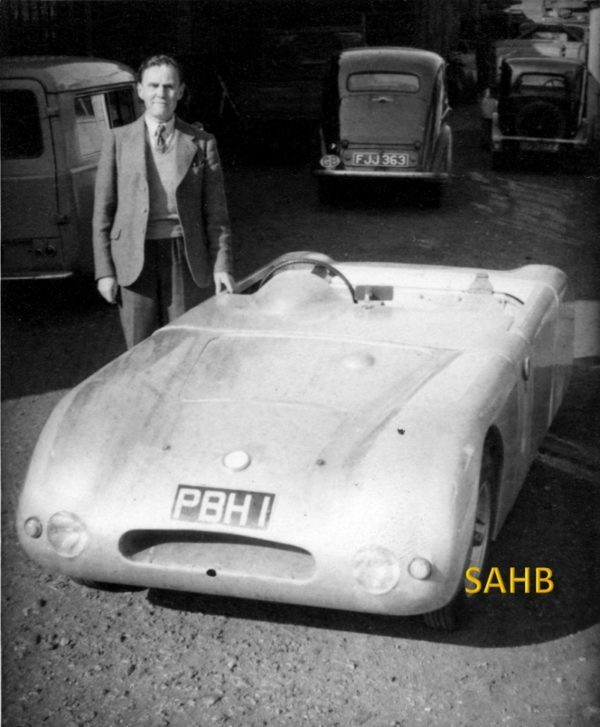 A major contribution to the success of his car was his use of not just a tubular chassis but one built on the space frame principle already adopted in architecture and aircraft construction to provide light but very rigid structures. Coupled with Buckler’s own independent suspension and clothed in a lightweight aluminium cycle-winged body, his car, famously registered DDP 201 (Bucklers are generally known by their registrations rather than chassis numbers), excelled in both its power to weight ratio and its handling. Not wanting to appear new to car construction, Buckler’s first production offering was styled the Mark V – the next would be the Mk X – while a slightly longer wheelbase version was dubbed the Mk VI. Development and production continued into the 1960s with the space frame principle eventually being applied to a central ‘backbone’ chassis. Although only two such cars are thought to have been built, the Buckler BB100 predated the introduction of Chapman’s better known Lotus Elan by several years. The Buckler name also became known, perhaps more so than for its cars, for the successful range of racing karts produced in the 1960s. The photograph, issued by the company as a publicity shot, shows a Buckler 90 – so named because even in modest 1172cc Ford powered trim it was capable of 90 mph – constructed from a kit by apprentices at RAF Halton in the mid-1950s. Standing alongside is Wing Commander Lane, one of the officers who drove the car in 1172 Formula races. The registration PBH, led to the nickname “Poor Bloody Halton”. The Ford saloon in the background, registered FJJ 363, was Derek Buckler’s regular transport and the photograph was taken at Buckler’s Caversham Road premises, Reading. This year marks the 70th anniversary of the Buckler marque and is being celebrated by members of the Buckler Register at several events throughout the year. Interestingly, Bucklers were made just around the corner from Wolsely Road, Caversham, where HE cars were also manufactured.